3-way stainless-steel ball valves. Stainless-steel is used for aggressive and corrosive media. 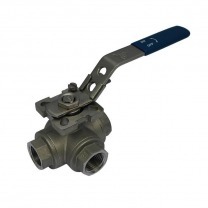 The material is durable and these ball valves are often resistant to high pressures and temperatures. 3-way ball valves can have a T-bore or L-bore. This makes it possible to set multiple flow patterns with the valves handle. Please refer to the overview image for all possible flow patterns.